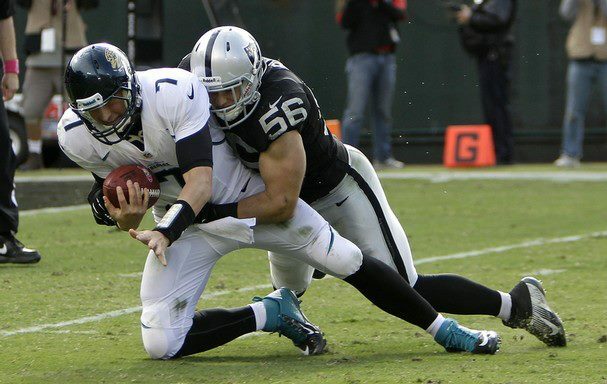 In a battle of former San Diego State linebackers, Allen’s Jaguars fell to the Raiders and Miles Burris in overtime, 26-23. Allen had four tackles and one fumble recovery in the game. The Panthers were defeated by the Cowboys, 19-14, and Applewhite did not record any tackles. He appeared to tweak his hamstring on the first play of the second half as he limped off the field following the kickoff. He did not return to the game, and his status for next week is uncertain. In a big overtime victory over the Jaguars, Burris played one of his best games yet. He had 7 total tackles, and recorded the first sack of his NFL career when he took down Jaguars’ quarterback Chad Henne for a loss of 10 yards. Burris is becoming one of the most important players on the Raiders’ defense, as he was on the field for all 63 defensive snaps according to NFL blogger Steve Corkran. Although the Seahawks lost to the 49ers last Thursday, Farwell continues to solidify himself as one of the top special teams tacklers in the league. He had one tackle in the game, and is tied for first in the NFL for special teams tackles with nine. Farwell led the league in special teams tackles in 2011. With John Skelton starting at quarterback, the Cardinals were defeated by the Vikings, 21-14. Lindley is once again the backup, as Kevin Kolb is expected to miss several weeks after suffering an injury to his ribs and sternum. Louis and his fellow offensive lineman had their hands full Monday night with Ndamukong Suh and the rest of the Lions defensive line, but the Bears were able to come away with the win, 13-7. They improved their record to 5-1. In a back-and-forth game, the Bills fell to the Titans, 35-34. Morrison was inactive once again, and has yet to play in a game this season. There is still no clear reason as to why he is inactive. For the second consecutive game, Osgood recorded a tackle on special teams. The Lions struggled as a team, however, and could not find a way to get their offense going in the loss to the Bears. Schilens failed to record a catch for just the second time this season and the Jets were defeated by the Patriots in overtime, 29-26. Did you miss the “Aztecs in the NFL: Week 6″ post? Check it out here!